Kinston, NC Bojangles'® Tands, INC. Store #1 - Bojangles'® / Tands, Inc.
Our Kinston, NC customers know where to go when it’s Bo Time! They come to our Kinston location for all their Bojangles’® menu favorites, including our famous made-from-scratch biscuits, Cajun-style fried chicken, and our Legendary Iced Tea®. We serve delicious options all day long for breakfast, lunch and dinner. 400 W Vernon Ave is the Tands, Inc. flagship Bojangles’® store, and the 15th store in the Bojangles’® franchise. 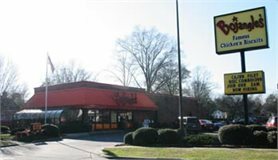 Opened in 1980, this Bojangles’® location has maintained the original vintage look and is still a popular spot for all Kinston residents.